Welcome to our December Newsletter. December is a quiet month in the garden. It is the month to reflect and to plan the year ahead. After a great gardening year we deserve to rest a bit, just like nature does in winter. I would like to take this opportunity to mention the Irish Seed Savers Crowd Funding appeal. The Irish Seed Savers are a wonderful organisation based in Co. Clare. Their main focus is the protection of endangered apple and other fruit cultivars as well as many endangered vegetable varieties. To date well over 100 previously lost Irish apple varieties have been re-discovered by the Seed Savers, propagated in Co. Clare and made available to gardeners all over the country. We will soon be stocking a small range of seeds that were collected by the Irish Seed Savers. 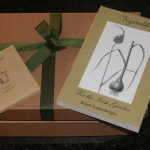 This month we have added a gift box as an idea for any budding gardeners who you think might like to get their hands dirty. Hedges do not always need to be very formal and neat, they can also be very useful. Instead of having a neatly pruned dense hedge you can design and manage it a lot more natural, very similar to a woodland edge. And why not choose shrubs that are actually useful. There is a wide range of shrubs that produce edible berries or nuts for eating (some more delicious than other) as well as for making jam or wine. Many of them have excellent medicinal properties and very high vitamin contents. The native hawthorn is a great snack plant in late summer to early autumn. It grows nearly everywhere and since the herbalist Judith Hoad told me that everybody should eat three berries every day as a prevention for heart diseases I forced myself to do so. I since got used to the taste. The elder is one of my favourite useful tree. It produces delicious flowers and fruit both useful for drinks and jams and with well-known properties. I knew somebody in the south of England that planted a large elder orchard for elder flower cordial production. Sloe berries are absolutely wonderful for sloe gin and jam making. They are very stringent to eat raw but I somehow like the experience. Sea buckthorn (Hippophae rhamnoides) and the Rosa rugosa. They are both absolutely delicious and healthy. Sometimes cultivars of wild fruiting shrubs have either larger or more ‘edible’ fruits. This is certainly not a comprehensive list of useful edible shrubs. There is massive scope for experimenting and you can also add cultivated fruits such as gooseberries, blackcurrants and many other fruits into your hedge. Please don’t worry about the birds. They will take half the fruit and leave you the rest. There is a lot more to plants than what meets the eye. Plants have adapted and survived successfully until now and they have managed to cope with their enemies – the herbivores or plant pests. It’s quite amazing to think that plants have developed their own strategies to cope with all those greedy plant eaters. – Some plants can decrease the protein content in the leaves so they are less attractive. – Some can change the chemical nature of proteins and make them indigestible for herbivores. – Some even change proteins into toxins that can kill animals when they consume them. – Some store nutrients in other, more safer, plant parts. Obviously, the herbivores are not happy about all that and had to change their habits as well (they co-evolved). They had to specialise and become able to exploit specific plant nutrient stores. This explains why certain pests specialise and attack only members of related species (eg cabbage rootfly, carrot rootfly, cabbage white butterfly etc). How can plants defend themselves? We are all familiar with the more obvious plant defences such as thorns, waxy, slippery, downy or hairy leaves. Their use is to prevent attacks from their enemies. You’ll notice on a holly tree that the lower leaves are a lot more prickly and often the leaves higher up are not prickly at all because they are much safer up there. Plants can produce compounds that can act as toxins, deterrents or repellents for herbivores and discourage them from feeding. They are called allelochemicals. A lot of herbs and also chillies have plenty of these compounds and we use them for their culinary use and health properties. And interestingly, most studies comparing organic versus non-organic food find that there is a significant increase in secondary metabolites in organic food. Organic vegetables simply have to defend themselves! And now the most unusual fact: The cabbage family has developed the secondary chemical ‘glucosinolate’. This deters most herbivores but unfortunately one well-known insect has evolved to cope with it – the cabbage white butterflies with their greedy caterpillars. And not only that – the caterpillars make use of the toxin in their bodies and thus protect themselves from their predators. Did you ever notice that birds are not very fond of the cabbage white caterpillars? And now the most amazing finding. 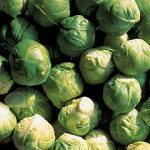 Teagasc reported recently in their magazine Today’s Farm Nov/Dec 2013 (author: Stephen Alexander) that Brussels Sprouts especially contain lots of glucosinolates and one especially which is called sinigrin. This compound is produced by the plant to protect itself from rabbits and slugs. It’s toxic to pests but not to humans; quite the opposite. The Institute of Food Research in Norwich found that it has no nutritive value for humans, but possesses health promoting qualities. They found that if sinigrin is ingested it breaks down isothiocynate which causes cancerous cells to commit suicide. Or simply – eat lots of sprouts.